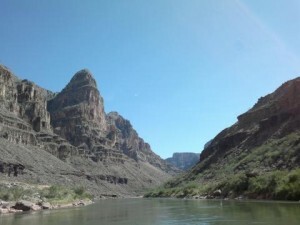 This white water rafting trip on the Colorado River through the Grand Canyon was enhanced by the visit to the Bar Ten Ranch. The staff provided great activities as well as tasty food. The talent of the staff was a pleasant surprise and very enjoyable at the end of a fun-filled day. While there are other white water raft trips that may provide more of an adrenaline jolt, the combination of challenging white water rapids, incomparable scenic Grand Canyon landscape beauty and attentive Western River guide staff makes this white water rafting trip a must experience. Once you have completed the natural roller coaster ride through a white water rapids section, you then had the opportunity to revel in the beauty of the Grand Canyon landscape (not named Grand for nothing). At the end of a thoroughly enjoyable day spent on the river, the Western guide staff prepared and presented more than acceptable meals and provided entertainment. These elements made for an extraordinarily memorable White Water Trip through the Grand Canyon that I will treasure. I shared this memorable experience with my son which made this memory all the more important,.